Collectors were challenged Thursday in early attempts to place orders for the highly anticipated 2013 American Eagle West Point Two-Coin Silver Set. Sales Update: In the final hours of availability, orders for the set jumped 29,615 to end at 281,310. This article will be updated with a final sales total reflecting returns and cancellations. However, the U.S. Mint is not expected to report that figure until October since it states some of the sets will not ship until September. The United States Mint is experiencing technical difficulties. During this time period, you will not be able to use the website. To place an order, please call 1-800-USA-MINT (872-6468). We apologize for the inconvenience. "Catalog Web site (is) slow due to demand. Please return later to access — thank you!" "Our online catalog has not stopped working. However, because of the large number of customers attempting to place orders for the American Eagle West Point Two-Coin Silver Set, you may experience delays. This product will be on sale through and there is no mintage limit, so try later when the site is not experiencing so much traffic. We apologize for the inconvenience and appreciate your patience." Early buyers do hope, however, to get their set(s) quicker and some will send their new coins off to a grading service to get "First Strike" or "Early Releases" designations. Like it or not, coins graded with such designations tend to sell for more. And when there is money on the line, frustration builds easier. Some red-faced comments have appeared on collecting forums with collectors deriding the U.S. Mint for not upgrading a system the Mint has already admitted needs updating. But the price tag to do so is hardly trivial, and it could be argued that its wasteful to spend money to resolve an issue that crops up briefly once a year or so — especially when prospective buyers have at least a month to place orders for highly sought after products. CoinNews.net placed several orders for the West Point set to gauge opening demand. The earliest went through at 12:04 p.m. ET and was tagged with an order number in the 41478XXX range. Like others reported, we did experience down time where it was impossible to reach the Mint’s online catalog. By 4:00 p.m., sluggishness was greatly reduced for us. We had another order go through at 4:11 p.m. ET with a number in the 41500XXX range. By early evening, everything was smooth sailing. Our final online order went through immediately at 7:01 p.m. ET with a number in the 41508XXX range. In short, the U.S. Mint received more than 22,000 orders in about four hours even as downtime limited collectors’ access. Another 8,000+ were added in the next three hours. While some of those orders were certainly for different products, many collectors also had more than one 2013 West Point Silver Eagle Set in an order. It’s entirely possible that more than 100,000 sets will have sold by the end of today. From noon until the system failed 90 minutes later, close to 65,000 orders had been placed. We rebooted the system, which took less than an hour, and by 4:45 (3 hours and 45 minutes later) 110,000 orders had been placed. We want to emphasize that we are well aware of the need to upgrade our system — and we are doing that. We just need a bit of patience on the part of our customers. It is one of our top priorities as we move forward. The top of this article will get updated when the U.S. Mint provides new sales figures. Additionally, the U.S. Mint has added a sales odometer on the set’s product page that offers an approximate count of units ordered. That total is updated each business day at around 3 p.m. ET. Backorder dates did change in our orders. The first transaction had a backordered date of June 17, 2013 while the the second and third transactions both had dates of July 25, 2013. Generally speaking, these early dates don’t necessarily indicate shipping times — especially for the latter orders. The U.S. Mint tends to catch-up and often ships products earlier than first indicated. Special coins within the two-coin set include a 2013-W Reverse Proof American Silver Eagle and a 2013-W Enhanced Uncirculated Silver Eagle. The U.S. Mint notes that the set celebrates the 75th anniversary of the edifice that houses the U.S. Mint facility at West Point. Each of the Silver Eagles carries the "W" mint mark for West Point. 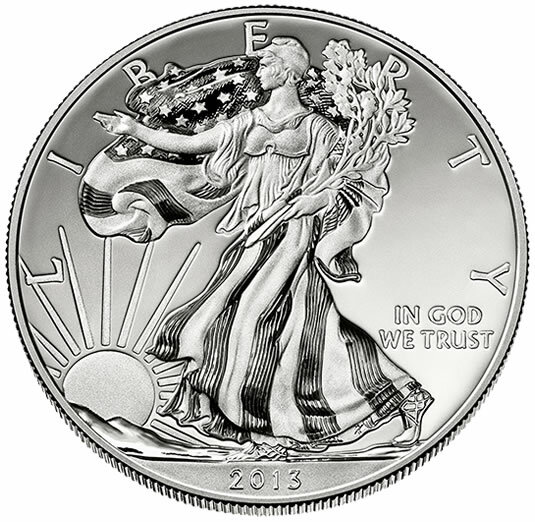 Reverse proof Silver Eagles have been offered in earlier years, namely 2006, 2011 and in 2012, but they are vastly outweighed in numbers by standard annual proofs that kicked off with the American Silver Eagle series in 1986. "Reversing the mirror-like background finish of a traditional proof coin and applying it to the design elements of the coin achieves a magnificent contrast," describes the set’s product page for the reverse proof. Enhanced Uncirculated Silver Eagles are brand new, featuring three different finishes that are the result of a newly developed polishing and laser technique that is applied to the dies that strike the coins. "On the obverse, the mountains, the red stripes and blue parts of the United States flag, the year, and Liberty’s sandals have an uncirculated finish. The remaining elements and lettering on the obverse have the heavy frosted finish. On the reverse of the coin, the ribbon in the eagle’s beak, the arrows and olive branch, the alternating stripes in the shield and the border around the shield have an uncirculated finish. The lettering and other design elements on the reverse have the heavy frosted finish. The fields on both sides of the coin have the light frosted finish." 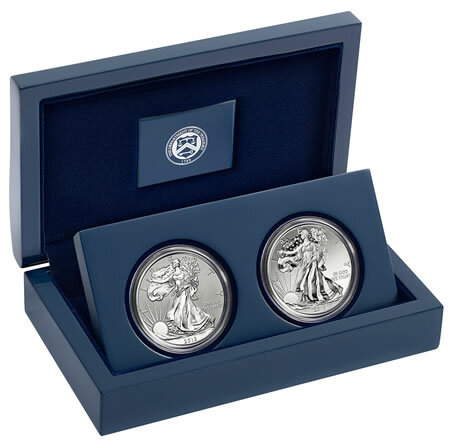 The 2013 Silver Eagle Set from West Point is priced at $139.95, which is $10 less than first published as a result of falling silver prices. The online product page for the two-coin set is found here. Use 1-800-USA-MINT (872-6468) to place phone orders. Ordered 6 sets on May 10, 2013 and today, finally, I received them. 99 days. I have a question guys that you may have an answer for. I have a 1996 Silver Eagle. Nothing special right? 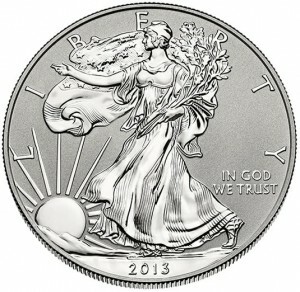 The question I have is that in the Walking Liberty side, the whole face of it is a mirror finish, BEAUTIFUL! The Strange thing is that in the Eagle Side, the Whole side has a burnished finish. IS THIS NORMAL? None of my other Silver Eagles (100+) aren’t like this. I have a Certificate of Authenticity too, from a very well known company. Any help would be of great service to me. I am really confused about it. COA not from the US Mint? W mint mark? Original packaging? What’d you pay for it? I suspect you might not have a real coin. But if you have a burning desire to know the truth send it in to one of the nationally known coin graders. They should tell you if it’s real or not.